It was in 2014 that Jamie Duncalf, managing director of IT for Calgary-based energy firm TransAlta, was in search of a new helpdesk ticketing system and decided to purchase a solution from ServiceNow Inc.
It’s not that the legacy ticketing platform was bad, he says, just that nobody was using it. It was confusing enough that staff would abandon making ticket requests and just approach IT staff directly in order to solve problems. ServiceNow’s cloud-based IT management tools did help Duncalf with his ticketing problem, increasing the number of incoming tickets by 40 per cent. “I had to explain to my boss that this is actually a good thing because this is work that’s always been there, but we can now actually see it,” he says. But it’s only the least of what the solutions are doing for TransAlta. 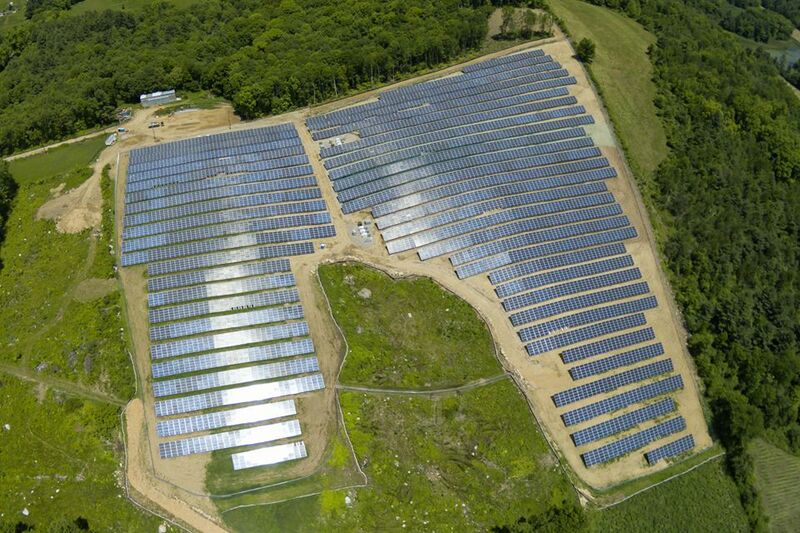 TransAlta focuses on clean energy production, such as this mass solar facility in Massachusetts. The 2,300-employee firm was embarking on its digital transformation with ServiceNow’s management tools as a foundation. In order to effectively service a team that maintains more than 70 power plants in three countries around the world, its IT team had to organize into being a service organization. ServiceNow is helping it get there and it’s become a key tool in its change management strategy. As more Canadian firms are drinking the Kool-Aid being served up by Silicon Valley and chasing a digital transformation vision, cloud services of the kind offered by Santa Clara, Calif.-based ServiceNow are suddenly not only on the radar, but making waves. At its core, the product promises to help enterprises measure their assets, processes, and systems accurately. From there, projections can be made about how changing one small piece of the puzzle will effect the rest of the organizational picture. Earlier in May, ServiceNow hosted its annual “Knowledge” user conference in Las Vegas. LeCuyer estimates that Canadian attendance was up 50 year cent compared to last year as more business leaders chase the digital transformation mandate. At the conference, they have other ServiceNow customers in the U.S. to look to for best practices. “We’re a fast follow market, maybe lagging in some areas,” he says. TMX Group is one example of a firm that’s trying to buck that trend. A user of ServiceNow for at least the last couple of years, it’s using solutions to handle incident management, change management, orchestration, and more. Like TransAlta, it started using ServiceNow for its IT service management capabilities. Today it’s helping the Toronto-based firm reinvent itself from market infrastructure provider to a technology-driven solution provider. TMX uses a shared services model to organize its staff, which calls on staff to share resources across different business units. ServiceNow makes this possible after decades of different business units operating in their own silos. So instead of each business unit deploying its own instances of Salesforce.com’s CRM, that can be discovered in the service catalogue and an enterprise-wide CRM can be established. ServiceNow’s facilities management module was also helpful when TMX relocated its Montreal staff to a new office building just one month ago. Moving all those desks used to mean employees had to fill out paper forms and wait days for their software to be fulfilled. Now a front-end portal facilitates all those requests and often automatic fulfillment is possible. Other times, a small approval step is required involving managers. Now Rajarathinam is preparing to deploy machine learning proofs of concept with the data made visible in ServiceNow. Take a server, for example, which has many components to it – an operating system, drivers, different software and hardware, etc. Using ServiceNow’s Discovery capabilities, that can all be tracked. If a specific type of network card starts producing issues, then a machine learning algorithm could map out where that card exists in TMX’s assets, what business functions it’s helping accomplish, and how severe the risk to the business is. In its fourth year of service at TransAlta, ServiceNow is being used to shed light on more complicated business problems as well. Over the next 12 months, Duncalf is hoping to learn more about outages experienced by the power plant by tapping the change management module. The root of this problem again goes back to users not cooperating with the system. A user makes a change using the tracking tool, but in reality, makes a change that is different than described. These unauthorized changes are correlated with outage events quite highly. So Duncalf wants to use the discovery tool as a cross-reference to the claims that employees make in change management. It’s taken a different form, but for Duncalf, the search for the holy grail continues.